This 1973 53' Hatteras Motor Yacht is one of the most spacious cruising yachts you can purchase today and this vessel is mostly original from the factory. Some designs succeed so well in the yacht marketplace that they earn the distinction of being industry classics. The 53 Hatteras is one of those designs. Two decades in production, the 53 Motor Yacht quickly became the standard by which other motor yachts her size were measured. Her bi-level, 3 stateroom 3 head floor plan is considered ideal in a motor yacht of this size and the split engine rooms soon became a Hatteras trade-mark. Thick fiberglass construction and a huge interior make this vessel a great cruiser and live aboard. The Office is new to the market and she has been priced to sell quickly although she shows in good condition for her age. The twin GM Detiort Diesels 871 turbos rated at 435 horse power each offers you a decent cruising speed of 15 knots and max’s out at 19 knots. She offers a fully enclosed aft deck, huge flybridge with helm and bimini, abundant forward deck space with electric windlass and dock boxes, easy boarding from the side deck stairway, twin salon doors, twin aft deck wing doors and lots of berths and heads for everyone’s comfort. She has a large galley down with full size appliances, a convertible dinette that seats 6, fully air conditioned and heated interior, great access to all sides of both engines for service and maintenance and good access to the diesel generator under the galley sole. With some upgrading to the boat and attention to detail, this cruiser can be modernized and be worth the 300K vessel it was back in the late 90’s. 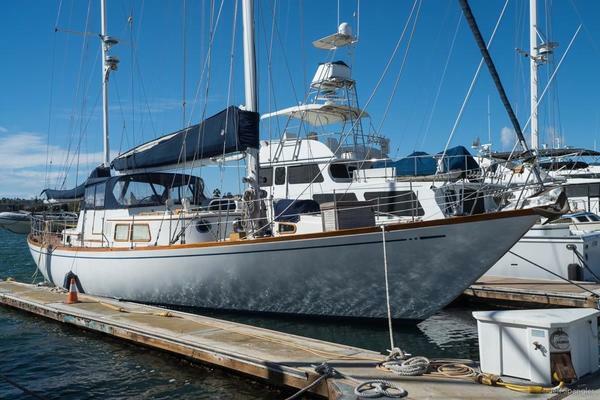 In her present condition, she is ready to motor away or stay in the live-aboard slip where she is located and you can enjoy living aboard across from the beach in beautiful sunny Florida. If this Hatteras MY is of serious interest to you, please call us today and start your cruising or live aboard dreams today. United Yacht Sales New Jersey would love to guide you through a personal showing of this 53' Hatteras 53 Motor Yacht 1973. This yacht for sale is located in Dania Beach, Florida and priced at $99,900. For a showing please contact us by filling out the form on this page and we will get back to you shortly! Enter the salon from the port or starboard sliding doors and forward you will find the lower helm, electrical panels, helm seat and electronics. There is a pair of desks to starboard followed aft by a cabinet, the 2 opening doors to the aft deck, a storage cabinet with flat screen TV and to port a leather sofa. The aft deck is enclosed with zip up isinglass and has port and starboard wing doors to access the side decks to go forward. The aft deck has a table and chairs, cabinet with ice maker, 2 swivel chairs and the ladder to the flybridge. The huge flybridge has the upper helm with drawers and a cabinet, Venturi windshield, SS hand rails, a port and starboard pair of settees and assorted chairs. The flybridge also has a large bimini for sun protection.Back down to the salon forward you will find a stairway to starboard leading down to the galley with large convertible dinette table to starboard, oven, 4 burner electric stove top, full size dishwasher, double SS sinks to port and full size refrigerator/freezer aft. Under the galley floor is the Onan diesel 12.5Kw generator and all battery banks. Moving forward is the first guest stateroom with over and under twin berths, storage cabinets and drawers, a large shelf to port, opening ports and a large cabinet housing the Frigidaire up and down washer/dryer. Aft of the galley is the walk thru hallway to the 2nd guest stateroom to port with 2 twin berths, shelves, cabinets, hanging closet, mirror and easy access to the double head to starboard. The head starts forward with electric toilet, sink, cabinets, towel racks, mirror and the door to the stall shower. Stepping thru the stall shower and aft door is another head with electric toilet, sink, cabinets, a mirror and another door to the aft master stateroom. Enter the master and find 2 bi-fold doors with huge closet forward, one large twin berth to port with drawers under followed aft by more storage drawers and large mirror and the starboard large twin berth with storage drawers under. There is also a hatch in the master ceiling that will get you up to the aft deck in case of emergency.The Office sleeps 9 owners and guests on 8 berths and has 3 heads with showers. This 1973 53' Hatteras Motor Yacht is one of the most spacious cruising yachts you can purchase today and this vessel is mostly original from the factory. Some designs succeed so well in the yacht marketplace that they earn the distinction of being industry classics. The 53 Hatteras is one of those designs. Two decades in production, the 53 MY quickly became the standard by which other motor yachts her size were measured. Her bi-level, 3 stateroom 3 head floor plan is considered ideal in a motor yacht of this size and the split engine rooms soon became a Hatteras trade-mark. Thick fiberglass construction and a huge interior make this vessel a great cruiser and live aboard. The Office is new to the market and she has been priced to sell quickly although she shows in good condition for her age. The twin GM DD 871 turbo rated at 435 horse power each offers you a decent cruising speed of 15 knots and max’s out at 19 knots. She offers a fully enclosed aft deck, huge flybridge with helm and bimini, abundant forward deck space with electric windlass and dock boxes, easy boarding from the side deck stairway, twin salon doors, twin aft deck wing doors and lots of berths and heads for everyone’s comfort. She has a large galley down with full size appliances, a convertible dinette that seats 6, fully air conditioned and heated interior, great access to all sides of both engines for service and maintenance and good access to the diesel generator under the galley sole. With some upgrading to the boat and attention to detail, this cruiser can be modernized and be worth the 300K vessel it was back in the late 90’s. In her present condition, she is ready to motor away or stay in the live-aboard slip where she is located and you can enjoy living aboard across from the beach in sunny beautiful Florida.